I’m very excited to announce that we’ve finally completed the first edition of Real Estate Listings & Copyright! The book is over two years in the making, we’ve invested much of our industry experience into it, and we’re now thrilled to share it! It’s available for purchase at CreateSpace. If you purchase the book before June 1, 2016, you can use the code “WND3782Y” for 20% off. However, each company to which the firm has provided services in the last 18 months will receive one free copy by mail, if they have not already received it in person. We think Real Estate Listings & Copyright will be a fantastic resource for MLSs and brokerage firms, but don’t just take our word for it. Here’s what others have to say about it. In this helpful guide, Brian Larson and Mitch Skinner deliver a comprehensive overview of copyright law that is perfectly tailored for the real estate industry. Its focus on real property listing data and photographs ensures that this book will serve as an excellent resource for multiple listing services, brokers, and agents for many years to come. Intellectual property has become part of the vocabulary of business and real estate. Many of the important issues are decided not by legislative action but by those of the courts. It is critical that brokerages, MLSs and associations consider all these issues in their legal planning and business communications. Brian and Mitch have extensive first-hand experience and involvement in the area and now present an extraordinary account and plan of action. 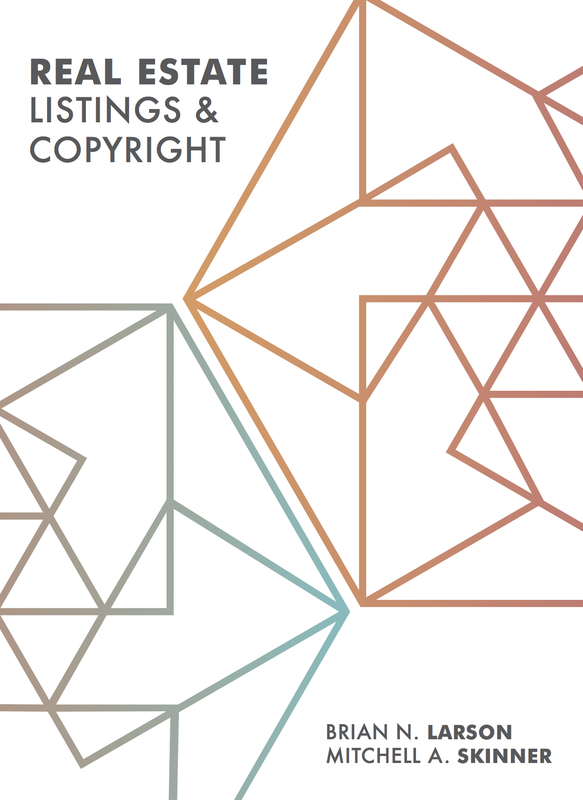 RE Listings and Copyright is, and will be for years to come, the definitive resource for organizations and leaders to tackle all things copyright and real estate listings. Many MLSs regard protection of the MLS database as a core function of the MLS. RE Listings and Copyright provides a foundation for MLSs and its participants to think strategically about such protection. With the help of Mitch and Brian, MLSListings successfully implemented many of the strategies described in this book; those strategies are now outlined for public consumption. RE Listings and Copyright is, to my knowledge, the first text that gives brokers’ strategic interests significant discussion. One of the most valuable assets in any business is inventory. In today’s cyber world this book is a must read for brokers committed to understanding copyrights to protect their listing inventory. Larson and Skinner lay out important strategic considerations regarding copyrights and real estate listings that will greatly help executives entering and managing agreements with third parties, including portals and contractors. RE Listings and Copyright provides valuable insights, helpful overviews and checklists of copyright issues that executives can utilize when licensing real estate listing content to third parties. This book sounds amazing and I think my brokerage should have it on hand. I’d like to talk to my OP about get it for each of us. Thanks for writing it. First question: If my Market Center (Keller Williams Honolulu) wanted to buy the book for each of us, do you offer it in a digital version for easy distribution and portability? (You know us Realtors are most often working on the road.) And, if so, is there a discount or license that would allow for mass distribution to the 300 associates? Or would we have to buy physical books at $99/agent ($30,000 plus shipping, I assume)?